Quinn Downing was born with severe epilepsy, suffering multiple seizures daily. 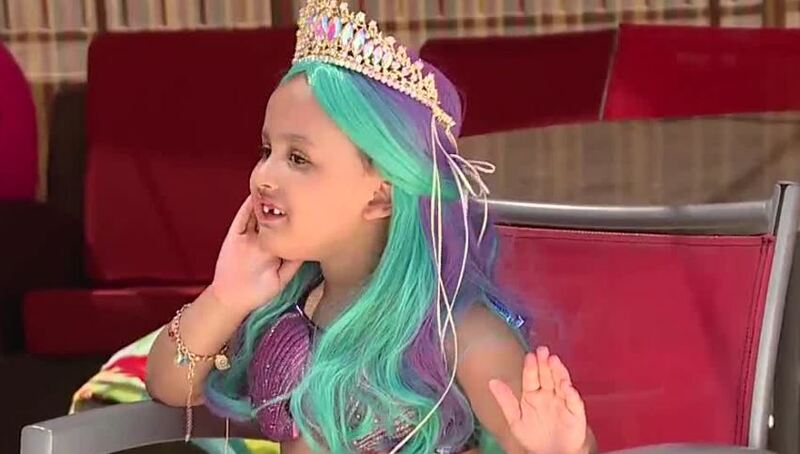 A 3-year-old girl was granted her wish to be a mermaid for a day Tuesday. Quinn Downing was born with severe epilepsy, suffering multiple seizures daily. But thanks to Make-A-Wish Southern Nevada, Mandalay Bay and Cirque du Soleil, Downing got to become a mermaid for a day. She often wears a protective helmet and uses a wheelchair, but has been medically cleared to be in the water for her “Mermaid-for-a-Day” wish. RuBen Permel, Cirque du Soleil assistant head of wardrobe for "The Beatles LOVE" at The Mirage, recently met with Downing to get her input on her preferences on a custom mermaid ensemble, complete with pink wig. Permel then created two full mermaid costumes for Downing: a dressy costume that will become her keepsake of this once-in-a-lifetime experience; and a costume in which she can swim.